1. If most footballers don’t know the dictionary definition of irony, how come they’re so good at ironic applause? 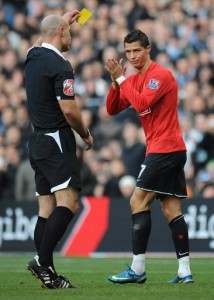 Stand up Cristiano Ronaldo, who was lucky not to be sent off after a few such claps in the face of ref Howard Webb. Still, C-Ron more than made up for it by being shown a red card, for blatant handball, later in the game. Stupid boy. 2. Arsenal’s inconsistency is, er, consistent. 3. The All Blacks weren’t scared off by 70,000 Torygraph readers drowning out the haka with a rousing rendition of ‘Swing Low, Sweet Chariot’. Surprise, that. 4. Paul Ince won’t last the season as Blackburn manager. Is it because he’s black? No, that has nothing to do with it – it’s because he’s a crap man-manager, innit. 6. We already miss Carly Zucker’s peachy bottom. ‘I’m a Celeb…’ isn’t the same without it. 7. Don’t take a British Lions squad to South Africa in 2009. Just take the Welsh. 8. Leed United fans are as lovely as ever. And well done Histon, ye mighty giant killers. 9. The Premier League’s big four are back in the top four, where they belong. Sigh. 10. Michael Phelps is a classy guy.